This fall a group of Estacada Middle School students rallied together when their friend was the target of racist comments. Danica Beguelin felt isolated after having hateful slurs said about her, and it was difficult to tell her friends about what had happened. But when they heard, the group of eighth-grade girls went to Vice Principal Deb Wexler with a plan to change things in their school. "We said we need to stop this," Anneliese Stricker said. 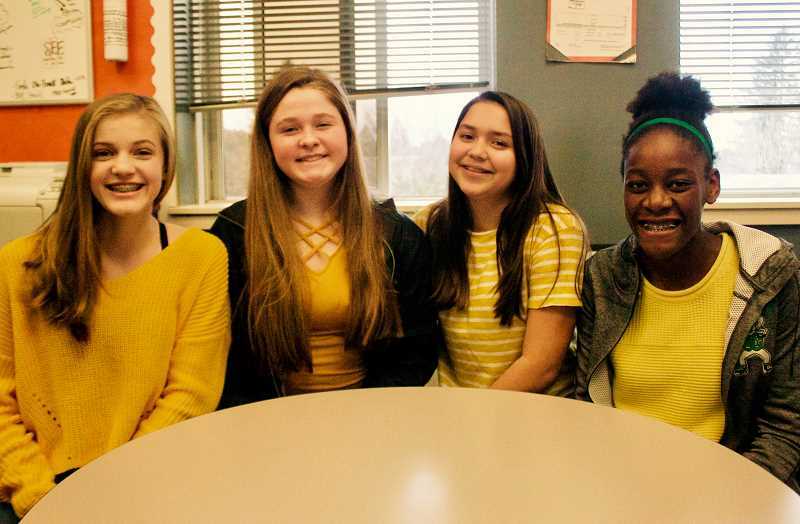 So Stricker, Olivia Davidson, Tia Garrison and Beguelin created the group You Are Not Alone (YANA) to support their peers and promote kindness throughout the middle school. The group is spreading awareness of the impact words can have on people and creating a support system for anyone who is experiencing bullying. One of the first things YANA did was instigate a kindness mission. They passed out slips of paper challenging students at the school of 400 to sit by someone new at lunch. Attached to the note were two pieces of candy, so those who partook would be able to share with their new friend. The group also hosted an assembly to touch on the problem of bullying — sharing anonymous stories from other students about the things they have faced in the school. The issues ranged from hate speech to physical violence. "I didn't realize how much bullying was happening in the school," Garrison said of the assembly. YANA has put up signs in every classroom at the school, working to get more students to join the group. When someone joins, they sign a pledge to only spread kindness in the school. Yellow bracelets for everyone in YANA helps remind them of that pledge. Their motto is "Positive Vibes Only." "The group has let us meet a lot of new people already," Beguelin. "People are starting to understand the impact of their words." to follow the lead of their peers. "Teachers have said they have seen a difference," Davidson said. The group plans on having meetings in the future, and more kindness challenges. Right now YANA is fundraising to purchase T-shirts so they can be even more visible within the school. They won Youth of the Year at an Estacada Chamber of Commerce event, receiving some money to purchase the shirts, but they are working to raise more. Keep your eye out in local businesses around town for colorful YANA collection jars, and those interested in supporting them can visit www.gofundme.com/sdwc5-yana. And while the girls will be moving on from the school at the end of the year, they are already planning on bringing YANA with them to Estacada High School. "Anyone can come to the group if they need anything," Davidson said. "They will always have the members of YANA with them."